The City of Columbia Arts District has experienced significant progress since it was proposed in 2014, but many community members admit they still don’t know exactly what it is. Maury County Chamber & Economic Alliance, along with Maury County Young Professionals Group, hosted a panel discussion Tuesday at the Columbia Arts Building (CAB) to answer questions and inform the public about the district. This included addressing the current needs of businesses, parking and sidewalk construction and how the arts positively impact communities. 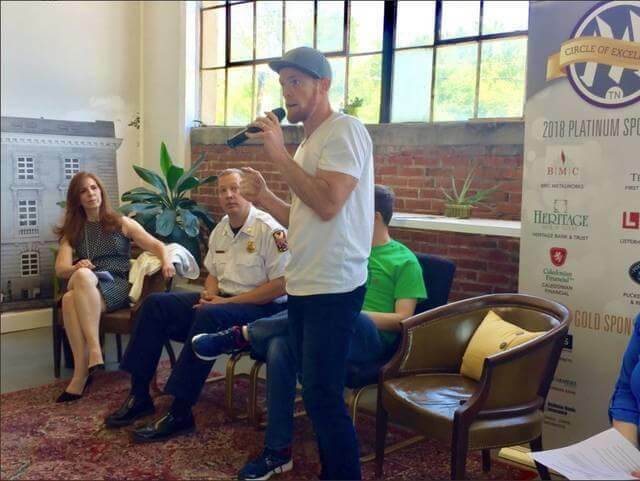 Tuesday’s panel consisted of Columbia Marketing and Tourism Director Kellye Murphy, Columbia Fire Chief Ty Cobb, Columbia Arts Council member Ross Jaynes and Aaron Rudd, owner of Muletown Collective located at the CAB. The discussion began with each panelist’s opinion about what the arts district represents, and how they have seen its positive impact on Columbia. As a business owner, Rudd said working in the district has not only put food on the table, but has also helped restore some of the city’s dilapidated structures into new business opportunities for many people, such as the CAB, Muletown Lumberyard, Battleground South Cigar Lounge and Windmill Bakery. The arts district stretches from the Maury County Public Library to the Columbia Train Depot, with South Garden Street and South High Street acting as parallel boundaries. Jaynes said the district has significantly increased the quality of life for the community by creating things like arts-related events, and has given the city a long-term project that will continue to expand. Currently, the work in establishing an arts district has been nearly five years in the making, but that is only the first phase, he said. Jaynes added that the economic impact of arts in the community has a seven-to-one impact on dollars invested. This means that for every dollar spent, seven are made in return. Cobb said it is also important to note how a lot of the work has been tied into education and public safety, such as construction of the new Firefighter Park at Columbia Fire Station No. 1, which is expected to be completed by September. Murphy, who worked 18 years developing Franklin’s downtown tourism market, said she has long-term goals for the district, such as improving sidewalks, hanging banners and launching an arts and tourism website, while also establishing a plan with the city. In February, the city applied for a grant with FEMA to form an arts master plan, which she said will be presented to Columbia City Council in June. Tourism is the second-largest industry in the state, with $19.3 billion spent on travel spending in 2016. Maury County generating more than $123 million based on the 2016 data, Murphy said. Some members of the audience asked if a partnership could be established between the city and the county to help promote and develop the next phase of the arts district. Although there aren’t concrete plans for the county’s involvement, the invitation is there for anyone with the ideas, funding and talent to bring to the table in helping shape the future of the arts district. For information about businesses within the arts district and ways to get involved in its development, visit the city’s website at www.columbiatn.com or contact Murphy at kmurphy@columbiatn.com.